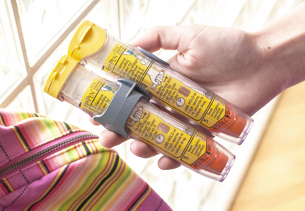 What’s inside your EpiPen® (epinephrine injection, USP) Auto-Injector and its authorized generic? You’ve probably heard of epinephrine under it’s non-technical name—adrenaline. When you ride a roller coaster or give a presentation, you may feel your heart beat a little faster, your breath intake increase and a sudden burst of energy. That’s adrenaline at work, a substance your body naturally releases under stress. And the medicine inside EpiPen® and EpiPen Jr® (epinephrine injection, USP) Auto-Injectors and Mylan’s authorized generics happens to be a synthetic version of adrenaline—epinephrine. Epinephrine vs. Adrenaline? What’s the difference? Nothing. Epinephrine and adrenaline are the same thing. However, the preferred name of the substance inside your EpiPen® Auto-Injector or its authorized generic varies by where you live. In Europe, the term “adrenaline” is more common, while in the United States the term “epinephrine” is used. So, how does epinephrine work during a life-threatening allergic reaction? It constricts blood vessels to increase blood pressure, relaxes smooth muscles in the lungs to reduce wheezing and improve breathing, stimulates the heart (increases heart rate) and works to reduce hives and swelling that may occur around the face and lips. When to treat with epinephrine and antihistamines. According to national food allergy guidelines, epinephrine is the only recommended first-line treatment for anaphylaxis. Not antihistamines, which do not relieve shortness of breath, wheezing, gastrointestinal symptoms or shock. Therefore, antihistamines should not be a substitute for epinephrine.